At Railscamp on the weekend, we were surrounded by the beautiful area around Piccadilly. You can see some of the photos on my Flickr stream. One of the things that I noticed though, was the beautiful wetland on the lower end of the property we were on. It had the sign you see below on it. 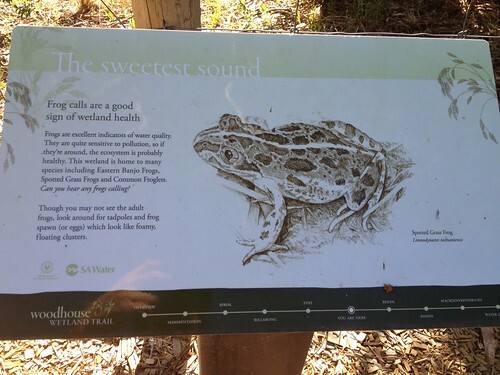 Frogs are excellent indicators of water quality. They’re quite sensitive to pollution, so if they’re around, the ecosystem is probably healthy. My simple post today is to ask how that applies to what you do everyday and the ecosystem that you’re working in. What does it sound like when it’s healthy? What are the frogs that appear when it’s all going well? And how can you curate your habitat to encourage more of those sounds? Doing something awesome? Apply for an Awesome Foundation Sydney grant!!! Hey Steve – I really like the way you’ve drawn a comparison here by drawing on nature.. We live in such a techno world, that I think we often forget what nature can teach us. If you think about how long we spend learning about things like ecosystems, leadership, teams etc – that’s nothing compared to how long nature has spent learning about these exact things too. Before reading any book or attending a course, we should first look into nature and see if we can find any evidence of these things already happening. When I was in Zimbabwe about 4 years ago I visited a protected nature reserve. We came across a herd of buffalo which were being lead by none other that one sole little elephant! This elephant had lost it’s family in some kind of incident and had attached itself to this herd (thinking it was one of them!). It then grew up with the herd and through it’s protective nature, came to lead them and protect them. The buffalo loved it, as it scared off all the lions! The elephant..and probably the buffalo thought they were of the same species. What can we learn from that..? What a fantastic story 🙂 I love the idea of the lost elephant becoming a member of the herd. Very cool. Have I ever shown you any Biomimicry stuff? It’s essentially what you said in your comment – I think you’d love it!